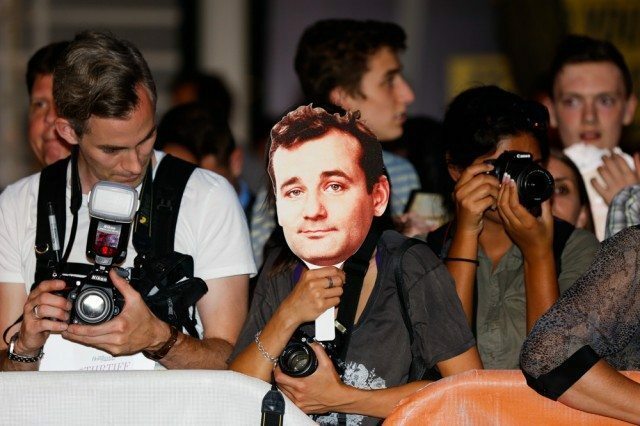 Yesterday was Bill Murray Day in Toronto. Murray’s new movie, St. Vincent, premiered at TIFF last night, and the Lightbox unspooled a couple B-Mu classics. I saw a kid dressed up as the Stay-Puft Marshmallow Man from Ghostbusters waddling around the Lightbox. It was cute. But since I can’t help but be cynical about everything, I can’t help but be cynical about Bill Murray Day. Murray’s whole appeal lies in his schlubbish, sarcastic, deeply ironized approach to his own celebrity. He is free of all the pretensions of stardom, preferring instead to make headlines crashing karaoke parties , slinging tequila at an Austin bar, posing for selfies with Torontonians, and generally acting like some stone-faced sprite figure, materializing whenever he deigns to impart someone with an incredible anecdote, more myth than man. But no matter how near Murray is to jumping the shark, hailing him with pomp and circumstance strikes me as antithetical to all of this, a demonstrably un-Bill Murray-ish gesture. Still, it was sporting and demonstrably Bill Murray-ish of him to arrive to his own premiere wearing a sash and crown. Elsewhere, TIFF’s attempts to ramp up the pomp and circumstance at their film festival—sorry, your film festival—feel flat. I moaned yesterday about the King West street-fest initiative, which was supposed to improve. Well it hasn’t. Not really. The whole thing is suffocated by corporate upholstery that is totally inorganic, that feels, pejoratively, very Toronto. With the exception of a guy doing some slam poetry near the Princess of Wales yesterday afternoon, walking King West feels like being at an open-air car show. People slam pamphlets and Grolsch pins into your sweaty palms—stuff you’re just going to throw in the bin as soon as the well-meaning brand reps pass you. The street closure is basically an excuse for pedestrians to be assaulted by ads for The Equalizer and TIFF itself—in case you forgot, even for one second, that you’re at TIFF. And while the complain-train is a-rollin’: what’s with this weather?! Huh! Can’t these fancy “programmers” program something other than an apocalyptic rainstorm? Still, I guess a washed out, weirdly still midnight sky is a nice capper to Bill Murray Day. It looked like the end of Ghostbusters.